1) Mary Doria Russell: Author of The Sparrow — which appears on every list of favorite books that I ever write — as well as four other novels. Her topics have ranged from Jesuits in space to Italian Jews during World War II to the Wild West, but no matter the topic, her writing is beautiful and her novels always fascinate me in ways that I just never expect. 2) Diana Gabaldon: Granted, everything she writes is related to the world of Outlander, which I love madly. Whatever comes next, and after that, and after that, I’ll read. 3) Christopher Moore: Just cracks me up, whatever the topic. How can you go wrong with an author who tackles King Lear, Jesus, giant lizards, and talking fruit bats? No questions asked, I will absolutely read whatever he writes next… and the beauty of his writing is that it’ll always be something different and completely off the wall. 4) Gail Carriger: I fell in love with Gail Carriger’s steampunk, supernatural-saturated vision of Victorian England, and loved her Parasol Protectorate series. I’ve read the first book in her new Finishing School series, and will gladly dive in when she launches her Prudence series as well. 5) George R. R. Martin: I feel like this is a pretty sure bet, given that the next two big novels he writes should be volumes six and seven in the A Song of Ice and Fire series. However, if he decides to go in a completely different direction, I’m not sure that I’ll necessarily follow… although given how much I admire his writing, it’s most likely that I’d give it a try. 6) Stephen King: I usually love whatever I read by Stephen King… but I’m not always ready to dive into horror. So I can’t say I’ll always buy whatever Stephen King writes, but it’s a sure thing that I’ll at least consider it. 7) J. K. Rowling: This one’s tough. I have, so far, read everything JKR has written. Huge Harry Potter fan, but I didn’t actually care for The Casual Vacancy very much. I’ll be interested to see what she writes next, and I’ll definitely read whatever it is… but this “auto-buy” placement may not last long if her novels continue in the vein of The Casual Vacancy. 8) Jim Butcher: So far, I have read all of Jim Butcher’s novels. I love the Dresden Files series, and really loved Codex Alera as well. So yes, Jim Butcher is on auto-buy for me right now… but I hope he branches out and creates new worlds soon, too. 9) Susanna Kearsley: I haven’t read all of her books yet, so this one feels like a bit of a cheat. Still, having read three of Susanna Kearsley’s lovely books in the past year, and with her upcoming release, The Firebird, on pre-order, I think it’s safe to say that she’ll be on my auto-buy list for the foreseeable future. 10) I’ve saved number 10 for a trio of young adult writers. I haven’t read everything already written by these three, but what I’ve read I’ve loved. I may or may not go back and read all of these authors’ previously published works, but I can guarantee you that whatever John Green, Libba Bray, and David Levithan write next, I will absolutely read. As always, as soon as I hit “publish”, I’m sure I’ll remember a handful of others I should have included. But for now, that’s my auto-buy list. What authors are on yours? It’s hard to narrow it all down to just ten, isn’t it? I think JK Rowling has made just about everyone’s list and with good reason! I would certainly be adding Levithan and Bray to mine as well. Other notable additions include: Andy McDermott, Douglas Preston/Lincoln Child and Maggie Stiefvater. I’ve been meaning to get a hold of some Christopher Moore books. I hear they’re funny, witty and all around fantastic! I love everything I’ve ever read by Christopher Moore (and I’ve read them all!). Lamb is actually my favorite, but they’re all terrific. Oh my goodness, I forgot to add Diana Gabaldon to my list :O I have no idea how that happened. Maybe I should expand it? I don’t want to take anyone off! Nice list! Definitely agree on JK Rowling and John Green, and yeah, I really should read George RR Martin one of these days. Thanks for stopping by my list! J.K. Rowling, John Green, and David Levithan were on my list, too! And I really need to get around to reading Outlander and Game of Thrones. Great list! This was such a hard week to pick only ten! I’ve loved everything I’ve read by Jim Butcher and Christopher Moore, but I haven’t read enough to make them auto-buy yet. My list does include John Green and David Levithan, though! 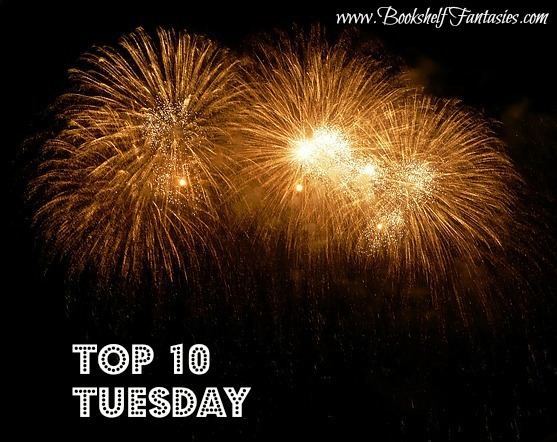 Check out the rest of my Top Ten Tuesday and let me know what you think! Thanks for stopping by! You’ve got a great list. I love Harry Potter, too, but The Casual Vacancy just didn’t look interesting to me. I think if I were to include her on my list, it would have to only be her children’s/YA books. I do think she’s a great writer, and very creative. I totally can relate to your cautiousness with Mr King. Sometimes he’s just a bit much–but then again, he did write my favourite novel ever (Under the Dome) so I should probably cut him a bit more slack. David Levithan was my number 11. He’s brilliant! LOVE Under The Dome. 11/22/63 also. I need to get back to the Dark Tower series — so far, I’ve read three, then took a break. He’s brilliant. 🙂 I’ve got to meet Jim Butcher and he is EXTREMELY COOL! He even showed us some karate type moves that he studied. I love his books too! Jealous now! I keep missing him on his book tours. Guess I’ll have to keep reading Dresden books until he comes to my town again! Wait, Gail Carriger is working on a third series? I didn’t know that! I think it’s due in the fall: The Parasol Protectorate Abroad series, focusing on Prudence (all grown up). Not YA, as far as I know. George R R Martin…how did I forget him???? I’ve barely read any of the writers on your list. But Jesuits in space has definitely piqued my interest! Well, “Jesuits in space” is kind of the glib description — it’s actually deep and tragic and lovely… but there are, in fact, Jesuits, and they do travel through space! Oops, I guess I have should have said! It’s called The Sparrow, and it’s wonderful. Interesting list! I’d like to read more of Libba Bray’s work, but my library doesn’t seem to have a full selection. Also, I totally agree with you about Jim Butcher and Gail Carriger. They can do no wrong in my eyes. I finished E&E this morning and I don’t want to wish the year away, but I do wish it was November already so I can get my mitts on a copy of Curtsies and Conspiracies! I match at least half your list, and I must add the ones who don’t match to my ever-growing to-read list. The only one I can think of who I would add to my own auto-buy (aka “willing to buy if I can’t get my hands on a library copy”), off the top of my head, is Patricia Briggs. I’ve read all of hers, the newer urban fantasy stuff and the old-school high fantasy and, while I like some books some more than others, I always love her. Oops-got an extra “some” up there. Robin Hobb was on the list for her first 3 fantasy trilogies too, which I highly recommend. For some odd reason, and I’m not sure how long it lasted, they came out in the UK first (she’s American, so go figure). I loved her so much I’d order them from Amazon UK. Her Soldier Son trilogy was a deal-breaker for me, though. I’ve never read anything by Robin Hobb. Where would you suggest starting? Assassin’s Apprentice. One of my all-time favorite trilogies. 2nd book is Royal Assassin and 3rd is Assassin’s Quest. Fitz is one of those characters who stays with you a long time.